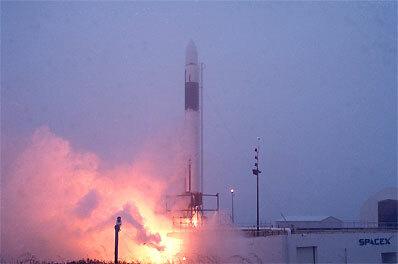 The NOAA-N weather satellite is launched aboard a Boeing Delta 2 rocket from Vandenberg Air Force Base, California. Rocket-launch newcomer Space Exploration Technologies Corp. today accomplished a critical engine firing at California's Vandenberg Air Force Base, a long-awaited event that puts the company much closer to its inaugural blastoff later this summer. The Falcon 1 rocket roared its first stage engine during the dramatic five-second firing to demonstrate countdown procedures and ring out equipment bugs at the rebuilt Space Launch Complex-3 West pad. After two false starts in recent weeks, the 70-foot-tall vehicle rumbled to life as today's countdown hit the planned T-minus zero second mark at 9 a.m. local time (12 p.m. EDT; 1600 GMT). The low-cost, privately-developed Falcon 1 rocket is the creation of Elon Musk, the South African spending his own cash to bring the new launcher from the drawing board to reality. Musk was co-founder of PayPal, the online payment system, and earlier the Zip2 software company. "Today we completed the largest milestone remaining before launch," Musk, the CEO of SpaceX, said in a statement. "In a few months, we will receive Air Force clearance to fly and Falcon 1 will make its maiden voyage. With the lowest cost per flight in the world for a production rocket and superlative design reliability, it has the potential to be the world leader in launches per year." Using a tiny launch team compared to the standing armies typically involved with the rocket countdowns, a seven-person control team, a five-person pad crew and three extra technicians performed today's engine firing. The nerve center overseeing the operation was SpaceX's mobile command trailer parked on Vandenberg's South Base -- about five miles from the pad -- that tapped into the installation's fiber lines and Range communications loops. The multi-hour countdown featured the loading of fuels into the rocket's first stage, only the third time that's happened at the new Falcon pad. The SpaceX-developed main engine, dubbed Merlin, burns super-cold liquid oxygen and a highly-refined kerosene to generate over 71,000 pounds of thrust. "A significant amount of our objectives are centered around learning how to operate on a Range, specifically Vandenberg Air Force Base. We have fired the engine many, many times at our propulsion test facility in Texas. So just firing the engine is not essentially a primary objective. 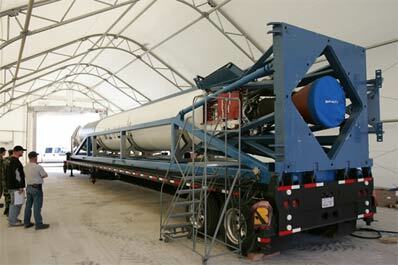 However, firing that engine at Vandenberg with a brand new system of (ground support equipment) is really important," SpaceX launch director Tim Buzza explained in an interview before the test. As clocks entered the final moments, the engine ignition sequence was triggered. Two earlier attempts over the past couple of weeks to perform this test were halted in the last seconds -- first by a faulty engine ignitor pressure sensor, and then by a mis-configured launch pad helium valve that was shut when it should have been open. But all appeared to go according to plan today. Merlin started igniting around T-minus 2.3 seconds as the main propellant line was opened, two internal ignitors fired off and helium spun-up the engine's turbopump. 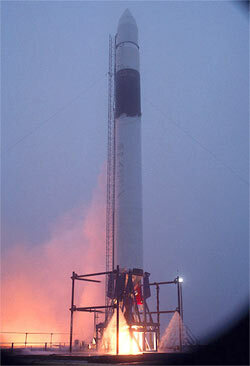 Merlin roared to full throttle as the countdown passed the T-0 point when the rocket would be unleashed on launch day. Falcon would not fly today, however. After running at top power for about three seconds and allowing computers to verify internal chamber pressure, thrust levels and the status of systems, the engine was commanded to shut down. The fiery event was called a success, proving that the SpaceX team and its hardware are ready for primetime. Crews tilted the rocket into a horizontal position using its erector trailer this afternoon, removing the vehicle from the pad mount. Remarkably, the vehicle was being driven back to SpaceX's manufacturing center near Los Angeles tonight -- a half-day after firing its engine. SpaceX has minimal facilities at the launch site, preferring to do virtually all of its work off base. Once back in the factory, technicians will remove the Merlin engine for shipment to Texas to undergo final checks. Also, the two stages that make up the rocket will be separated apart. The second stage's engine has not been installed yet -- it is still undergoing acceptance testing in Texas, Buzza said. A specific launch date for the debut mission is uncertain. The Air Force doesn't want the liftoff to occur until after a Titan 4 rocket flies from nearby Space Launch Complex-4 East at Vandenberg to deliver a classified spy satellite into orbit. Falcon's trajectory would take it over the Titan facilities, something the military wants to avoid until after the rocket and its top-secret payload have departed. Buzza said Falcon could be ready for launch within a week of the Titan's liftoff, which is expected no sooner than mid-July. SpaceX's customer for the first Falcon flight is the U.S. Department of Defense. The small TacSat-1 experimental communications satellite, built by the Naval Research Laboratory, will be carried into space.